In college I got a big ol’ wok for Christmas along with fun things like garlic oil, chopsticks, etc. It was so fun experimenting with new recipes even if it was on a tight college budget. 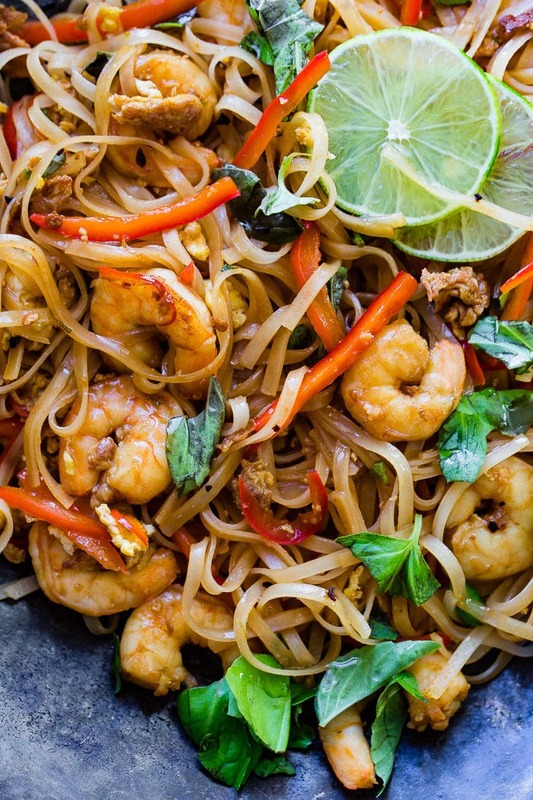 This One Pan Simple Asian Shrimp Noodles is inspired by that big ol’ wok. Shrimp did not ever appear on my college dinner plate, but this would be a perfectly easy recipe for any college student to prepare. Send this recipe to your son or grandson in college and tell him to invite that cute girl he’s had his eye on for dinner! Its a guaranteed second date! This recipe is a perfect one for anyone to try for that matter! College students, busy working moms, busy full time moms, or anyone that enjoys cooking homemade meals. It looks so fancy, but it honestly couldn’t be any easier! You know the feeling when you see a yummy recipe, and then you go to look at the ingredients and you only have like 2 of 47 things you need? That is THE worst! I usually move right on with my life and forget that recipe ever happened. That is not the case with this easy dish! Besides the shrimp, I bet there’s a good chance you have everything already. Oh except the fresh basil, unless you live where it is warm and you have some in your garden (I’m jealous!). Do you have everything?? Oh I guess most people probably won’t have rice noodles on hand either, but you can always use angel hair if you don’t want to run to the store. We will talk more about the noodles in a bit. 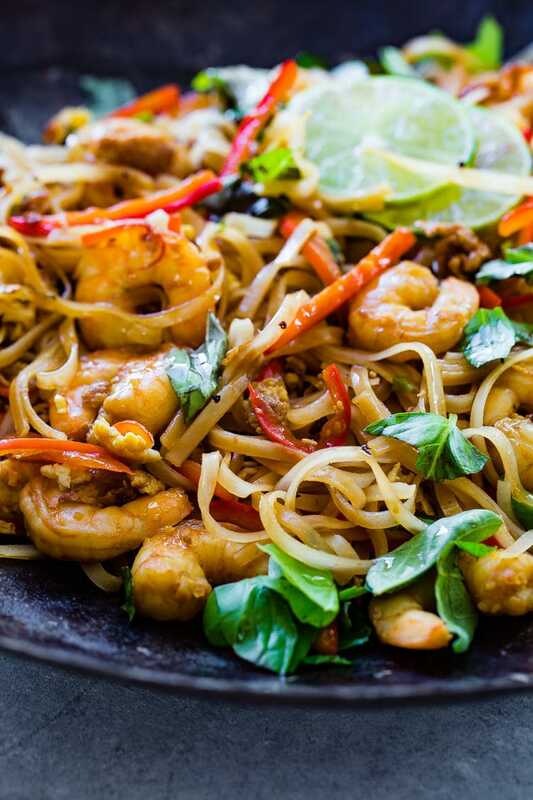 We recommend using a wok for this dish, but if you don’t have one, a large frying pan will work just fine. Our wok recently died, so I have been looking for exactly the one that I want. This is the one that I’m leaning toward. But then I second guess myself and think we might want to go electric. Do any of you prefer one or the other? How to tell when shrimp are cooked? Make sure your shrimp is deveined, just buy it deveined…trust me! Pay close attention to the crevice where the shrimp was deveined. When that crevice at the fattest part of the shrimp turns opaque, then your shrimp is done! Remove it from the heat immediately! 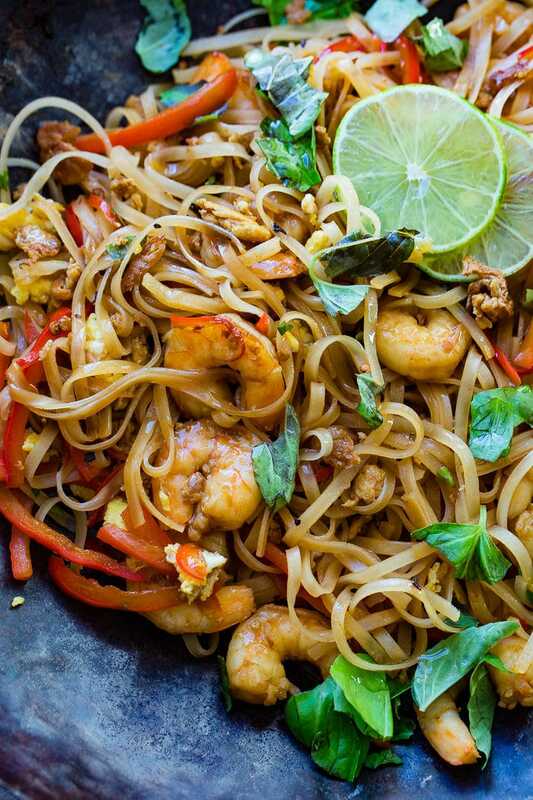 We have tried this dish with all sorts of different noodles, and rice noodles have come out the big winner. 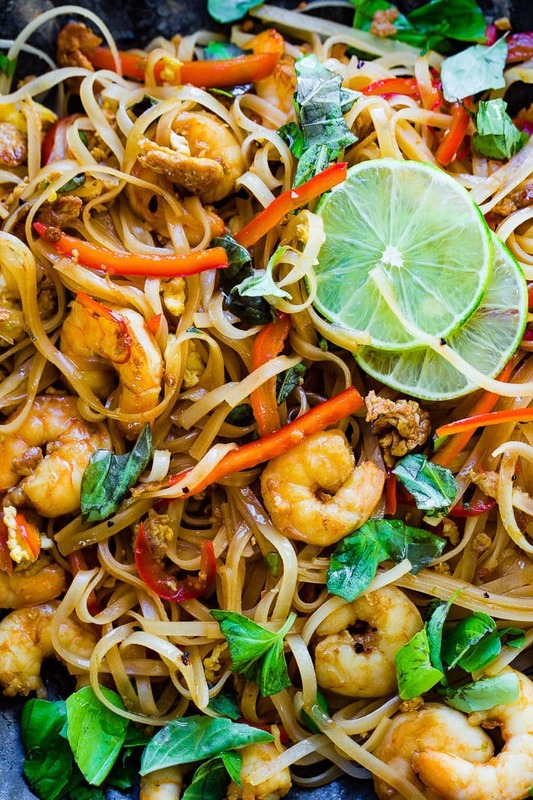 This dish is great with angel hair pasta and even spaghetti or Yakisoba noodles are good too, but there is something just right about the rice noodles. We even tried it with zoodles, which was also tasty and low carb, but still rice noodles win! Shrimp is one of those things that you either love or you hate. If you’re a hater, have no fear! Several different proteins can be used instead of shrimp. Our kids love this dish with good ol’ chicken breasts or thighs, and it is also delicious with some skirt steak, pork, ground beef, ground turkey, or even tofu if you’re a tofu fan. This recipe is super versatile, so make it exactly how you like it! What do I eat with this dish? Sometimes dishes like this leave me wondering what to eat with it. You have your protein, veggies, and carbs/starch all in one dish. One thing I love to do with this dish is to saute up some snap peas. So easy! Then we almost always have fruit of some kind. Just slicing up some apples or cutting up fresh pineapple does the trick! If you are entertaining guests, then our Lemon Mandarin Orange Jello Salad or just some simple Instant Pot Applesauce do the trick perfectly! How to Properly Reheat Shrimp? Shrimp doesn’t reheat very well unfortunately. You’re going to have to take one for the team and eat the whole pan. Haha! Totally kidding! Although, it has been done before! We recommend trying to only cook as much shrimp as you are going to eat. If worse comes to worse, you can eat the leftovers cold and it is still delicious! Reheated shrimp just doesn’t taste great, and it can get rubbery fast. If you absolutely must reheat, steaming the shrimp is the best way to warm those babies up! Now you’re ready to get in the kitchen! Start with your rice noodles and prepare them according to the directions on the packs. Then it is time to wok it up! Heat your oil and butter and cook the garlic for about 1 minute. Once you start to smell that yummy garlic smell, throw in your sliced red peppers and cook for a couple more minutes. Now it is time to add the shrimp. Toss those babies around for 2 or 3 minutes until they are just starting to turn pink and then add your egg. Stir briefly, then you’re going to add all your flavor! Add the lemon and lime zests and juices, soy sauce, sugar and stir until it all come together and starts bubbling. Then you can add the rice noodles and toss it all together until your noodles are covered in the yummy sauce. Remove it from the heat and sprinkle of torn fresh basil leaves. Eat while its hot! Looking for more quick and easy shrimp recipes? Try our Grilled Sticky Honey Lime Shrimp, One Pot Sticky Honey Lime Shrimp with Pineapple Chimichurri, One Pot Breaded Parmesan Shrimp Scampi Pasta, Popcorn Shrimp with Mango Chipotle Sauce, or Baked Coconut Shrimp with Tropical Dipping Sauce. If you want to start off this dish with a delicious appetizer, try these pork dumplings! In college I got a big ol' wok for Christmas along with fun things like garlic oil, chopsticks, etc. It was so fun experimenting with new recipes even if it was on a tight college budget. 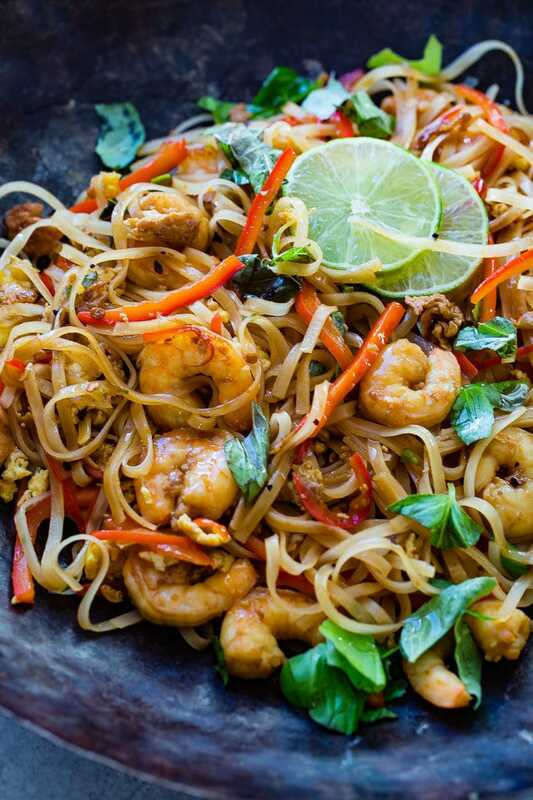 This One Pan Simple Asian Shrimp Noodles is inspired by that big ol' wok. Prepare rice noodles by following the instructions on the package, setting it in water to soften. Set aside. In a wok or frying pan over medium high heat, heat the oil or butter and cook the garlic for 1 minute, or until golden, stirring often. Add the peppers and continue to cook for another 2 minutes. Add the shrimp and toss for about 2-3 minutes, until almost cooked through, just turning pink. Quickly add the egg and stir for a couple seconds until egg starts to set. Add zests, soy sauce, and sugar and stir for a minute or so until the sauce is bubbling. Add the rice noodles and toss until noodles are hot through, evenly coating everything well. Turn off the heat and add fresh basil. Toss and serve immediately.